"A commendable scholarly work that fills a vacuum"
While remarkable discoveries are made in the fields of medical and physical sciences, seldom do we learn of further research being done to appreciate and reflect on the glory of our Buddhist heritage. Civilisations have been born and have been buried. But, it is known that philosophies and teachings of revered religious men still stand firm today to guide man’s destiny. Much of what religious teachers left behind in Asia, remain as ancient writings, in scrolls or ola leaves and are reflected also in granite rock ruins, for man to decipher weather- beaten ancient engraved letterings. Scholars who researched into the written word found in ancient manuscripts of Zorastrians, swamis of India and Buddhist monks of ancient Lanka, whose teachings are in Sanskrit, Pali or in Brahaminic script, have given us a wealth of valuable knowledge. 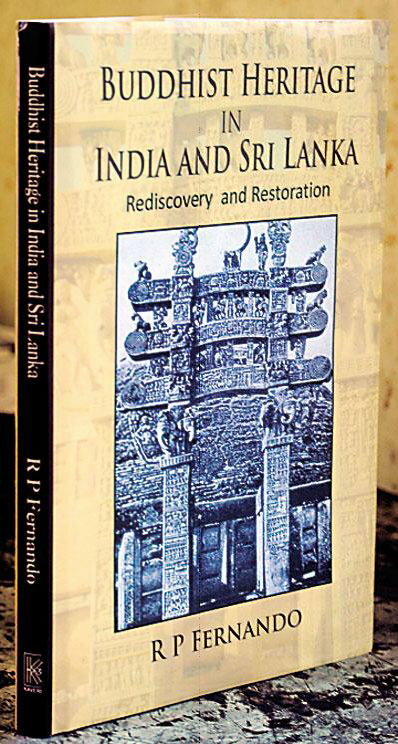 It is in this background that the publication of Buddhist Heritage in India and Sri Lanka (Rediscovery and Restoration) by Dr. Rohantha P. Fernando PhD, is commendable. The author has researched further to unearth the past glory made known by a gallant band of archaeologists and epigraphists, who worked long years, silently under trying environmental and social conditions. They were Sir Alexander Cunningham (1814-1893), Sir John Marshall (1876-1958), Capt. F.C. Maisey, and in Ceylon, H.C.P. Bell (1890) our first Archaeological Commissioner, Archaeological Department Surveyors and site Draftsmen P.G. Perera, D.A.L. Perera, W.M. Fernando who helped A.M. Hokart and Prof. Senarath Paranavithana. The author also refers to Ven. Naranvita Sumanasara Thera. In about 1878 Ven. Sumanasara saw the Ruwanveliseya Stupa in a state of ruin. He resolved to begin restoration work by himself, and lived alone courageously in an old bullock cart with a mongrel for company and protection from wild beasts. Governor Sir William Gregory appreciated his efforts and sent him a gift of Rs. 1000 (then a princely sum). History records that after Emperor Asoka’s glorious reign in India, the Muslim warrior Akbar the Great, destroyed Hindu, Jain and Buddhist sites of religious worships. Following that the Colonial British appeared. Sir Alexander Cunningham’s first move was to restore the historic Buddha Gaya temple which was under the control of Hindu Mahantha. The untiring efforts of Anagarika Dharmapala to wrest control of the site through the courts of Bihar and Calcutta have been spotlighted. Later, Cunningham moved to Nepal. With the help of a linguist scholar Dr. Fuhrer of Austria, he confirmed the site where Prince Siddhartha was born. Finally, after working hard to restore Nalanda, “the seat of Buddhist learning” he moved to Saranath, where the great master’s first sermon was delivered. Cunningham did much spade work at Sanchi where the relics of the Buddha and those of his disciples Sariputta and Maha Moggallana are. The author also refers at length to the contribution made by Cunningham’s successor Sir John Marshal (1876-1958) at Sanchi. With the help of a Sri Lankan Bhikkhu named Subuthi, he deciphered the carvings on the majestic rock gateways to be Jathaka Stories. Sir John Marshall was also responsible for the restoration of the Nirvana Vihara, where the Buddha passed away, and also the site of the Ardhana Stupa, two km away. The author refers to the establishment of the Colombo Museum (1875) by Sir William Gregory, amidst stiff opposition from the Home Office. They preferred to develop the railway network and the coffee plantations. The author has highlighted notable contributions made by Britishers to study Pali and Sanskrit. Sir James Emerson Tennent, George Turnor who translated the Mahawansa in 1837, R.C. Childers, publisher of the Sinhala Pali Dictionary, T.W. Rhys Davids and his wife Caroline, both Pali scholars, Sir Robert Chalmers, a Pali Scholar who left behind for posterity the Aluvihara Editions. The book also records the contribution made by scholar monks Ven. Hikkaduwe Sri Sumangala Nayake Thera, Ven. Weligama Sri Sumangala Nayake Thera, Ven. Waskaduwe Sri Subuthi Thera who were teachers to the Britishers. Other Britishers who helped the Education sphere of Ceylon were Mr. Leadbeater Principal of Ananda College, F.L. Woodward, Principal of Mahinda College of Galle and Sir Graham Thompson and Sir Herbert Stanley who had given land to establish Ananda and Nalanda College. The author finally pays a tribute to the Saxons who ruled Ceylon. They preferred to concentrate on the development of the coffee and tea plantations and the Port of Colombo, rather than interfere in the Buddhist ecclesiastic matters. A few British missionaries namely Charter and Bishop Copleston respected the rationality of Buddhism. This valued publication is a commendable academic effort and should be in every school and university library.